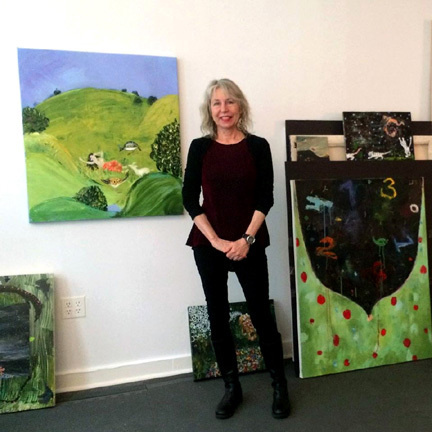 Painter Mary DeVincentis employs a deeply personal iconography to investigate the universal dilemmas and mysteries of existence. She is currently working on Dark Matters, a series of paintings exploring the shadow side of human experience and Sin Eaters, a series which depicts society's saints, martyrs, scapegoats and outcasts. Her work is represented by David&Schweitzer Contemporary in Brooklyn, New York, and has been previously exhibited at Life on Mars Gallery, the International Print Center, the New York Public Library, White Columns and the Brooklyn Museum. It is included in numerous public and private collections. She earned her Bachelor of Fine Arts degree from Maryland Institute College of Art and a Postgraduate Diploma in Advanced Printmaking from St. Martins College of Art in London, UK.